THE IMAGE ABOVE COMES WITH A SENTIMENT THAT SAYS GET WELL AND A BLANK FOR YOU TO MAKE YOUR OWN SENTIMENT LIKE I DID. I AM NOT LOOKING FORWARD TO COLD AND FLU SEASON. I AM LOOKING FORWARD TO SOME COOLER WEATHER. Beautiful card, sweet image and i love the colours. This is SO cute, Bunny. You always do such a nice job with your sweet cards. This one is no exception and I really love the shade of soft green (sea foam) you've used on this. It's lovely. I thank you so much for sharing your talents with us, my friend. 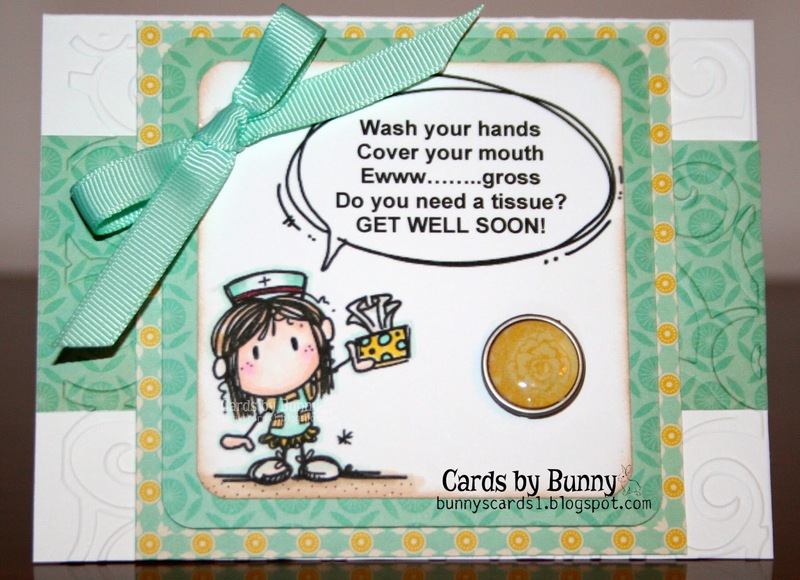 Sweet little get well card! Lovely this card. Funny sentiment. Good luck and I hope we see you again. Such a cute card and the image! Love your design and colouring! Thank you for joining us at TTCRD !